The "El-Dorado Topaz" discovered in Minas Gerais in Brazil, seems to get its name from the legend of El-Dorado, the city of the legendary golden king of South America, who at the time of his inauguration to the high office, was completely covered with gold dust over a layer of sticky mud previously applied on his naked body and then conveyed on a decorated raft with great pomp and pageantry to the middle of the deep and sacred lagoon of Guatavita, where he offered a great heap of gold and emeralds to the demon whom the Muisca people worshipped as their God and Lord, by throwing them overboard into the deep lake, and perhaps also diving into the sacred lake in order cleanse himself of the mixture of mud and gold. The offering of gold and emeralds to the God and the dip taken in the sacred waters achieved a spiritual cleansing that prepared the newly appointed king to the high office he was about to assume. The legend which originated in the Andes of present-day Colombia in the 1530s enticed European explorers who undertook expeditions in search of the legendary city for two centuries, but without any success. The most famous of these expeditions was the one undertaken by Franciso de Orellana and Gonzalo Pizzaro in 1541, who navigated the Amazon river all the way to its delta. The Muisca territories eventually fell into the hands of the Spanish, who realized that in spite of large quantities of gold in the hands of the Indians, there were no golden cities or gold mines in these territories, as the legends had suggested. The Muiscans obtained most of their gold by trade. However the legends refused to die down, as some of the Indians themselves believed in it, and some of them had in fact witnessed the Guatavita installation ceremonies. The name "El-Dorado" today is used metaphorically to denote any place where wealth could be acquired rapidly. In the United States, the name was given to El-Dorado County, California, and to various towns and cities in other states. It has also been used metaphorically to represent something much sought after, that may sometimes not even exist, or may not ever be found. The "El-Dorado Topaz" discovered in Minas Gerais, Brazil, seems to have been named as such, in order to perpetuate the memory of this undying legend that originated in South America, where the enormous gemstone also originated. The enormous weight of the rough stone, 37 kg. and the finished gemstone 31,000 carats, has created another legend, as the faceted gemstone has become the largest ever faceted gemstone in the world. The "El-Dorado" rough topaz discovered in 1984, in Minas Gerais, Brazil, weighed an astonishing 37 kg. After cutting and polishing the finished gemstone weighed only 6.2 kg. Thus 30.8 kg of the original rough stone was lost in the cutting process, equivalent to 83% of the original weight of the stone. This enormous loss in weight was mainly due to the poor non gem-quality material that constituted the original rough stone, which had to be removed compulsorily, in order to arrive at a reasonable product with good cut, color and clarity. Indeed the removal of a large quantity of the rough stone was justified, as the final product turned out to be an exceptional quality faceted topaz, with a perfect cut, color and clarity. The finished gemstone had a perfect emerald-cut, good clarity and a desirable yellowish-brown color. The weight of the finished stone was 31,000 carats (6.2 kg), and the stone became the largest faceted topaz as well as the largest faceted gemstone in the world. 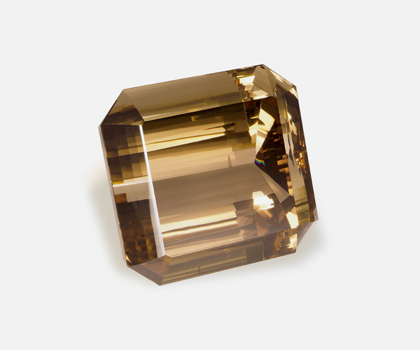 This twin distinction was previously held by the 21,005-carat Brazilian Princess Topaz of the American Museum of Natural History, New York, and later by the 22,892.5-carat American Golden Topaz of the Smithsonian's National Museum of Natural History, in Washington DC, but today they have been pushed to the 4th and 3rd place respectively. Please click here to view the list of famous topaz gemstones, greater than 1000 carats in weight, arranged in descending order of weights. Why topaz crystals can grow to enormous sizes ? Topaz is a gemstone that had been known by mankind for well over two millennia, and had been valued since ancient times, not only for its ornamental properties, but also for the spiritual, metaphysical, and medicinal powers the gemstone was purported to have possessed. Chemically topaz is a silicate, the most abundant mineral found on the earth's surface. It belongs to a sub-class known as Nesosilicates, having the formula Al2SiO4(F,OH)2, variously referred to as aluminum fluorosilicate, fluoroaluminum silicate or aluminum silicate fluoride hydroxide. The topaz crystal consists of chains of aluminum octahedra, formed by octahedrally co-ordinated aluminum cations linking together. The aluminum octahedra can be AlO4F2 or AlO4(OH)2. The long chains of aluminum octahedra are cross linked by the negatively charged silicon-oxygen tetrahedral units (SiO4)‾ This type of structure is very stable and the chains can grow to enormous lengths producing giant crystals. Thus topaz is one of the few gem minerals that can grow into incredible sizes such as the 37 kg El-Dorado rough stone. An enormous topaz crystal in the AMNH, New York, weighs a whopping 273 kg equivalent to 600 lbs. Topaz crystallizes in the orthorhombic crystal system forming long to short vertically striated prismatic crystals terminated by pyramidal or dome-shaped faces. The strong bonds and close packing of atoms and ions in the topaz crystal structure impart a high density, refractive index and hardness to the gemstones. The specific gravity of topaz is 3.4 to 3.6. The refractive index varies between 1.61 to 1.63. The chemical formula of topaz is Al2[SiO4](F,OH)2. The comma between F and OH means that the OH can replace F or vice versa in the crystal lattice. The more OH there is in the crystal the higher will be the refractive index and the value will be closer to the upper range 1.63. If the quantity of F in the crystal is higher the refractive index will be less and closer to the lower range of 1.61. The hardness of topaz is 8 on the Mohs scale, which makes it one of the hardest minerals in nature, and thus suitable for setting in jewelry. The luster of a gemstone is its brilliancy, determined by the amount of incident light reflected from its surface. The luster of topaz is adamantine to vitreous, i.e. something between the luster of diamond (adamantine) and ruby, sapphire and quartz (vitreous). Adamantine means resembling diamond in luster. Vitreous means resembling glass in luster. The diaphaneity of topaz which is the quality of being diaphanous or transparency, is transparent to translucent. In short wave length ultra-violet light topaz gives a golden-yellow fluorescence and in long wave length ultra-violet light a cream colored fluorescence. Cleavage is the tendency of crystals, minerals and rocks to break in preferred directions, known as cleavage planes, so as to yield more or less smooth surfaces. The cleavage of topaz is perfect and basal. Dispersion is the ability of a gemstone to bend white light separating it into the colors of the spectrum depending on wavelength of the color of light. Dispersion is measured in terms of the difference of the refractive index of the gemstone in violet light and its refractive index in red light, the two colors at the extreme ends of the visible spectrum. A dispersion greater than 0.03 is considered as high degree of dispersion. Both diamond (0.044) and cubic zirconia (0.060) have very high dispersion, and hence these gemstones have "fire" or "sparkle." The dispersion of ruby and sapphire is 0.018 much less than 0.03 and as such these stones lack the sparkle of diamonds. Likewise the dispersion of topaz is only 0.014. The lack of "fire" in these stones is compensated partly by their good luster, and an appropriate cut that can increase the dispersion. In rubies the red fluorescence produced in light rich in u-v rays also contributes towards the brilliance of the stone. Pleochroism or dichroism is the change in color that can be seen when a mineral is rotated while being observed in a petrographic microscope under plane polarized light. Pleochroism manifests itself as a change in color, eg. blue to red, or a change in the intensity of the color, eg. light blue to dark blue. Pleochroism is caused by the ability of a mineral to absorb different wave lengths of transmitted light depending upon its crystallographic orientations. The color that is observed is usually the complementary color of the color that is absorbed. Eg. If the wave length of transmitted light absorbed corresponds to green color, the mineral is seen as red, because red is the complementary color to green. Likewise if wave length corresponding to orange is absorbed the mineral will appear blue, as the complementary color of orange is blue. Pleochroism depends mainly on the crystallographic nature of the minerals. Isotropic minerals are always non-pleochroic. Hexagonal, trigonal and tetragonal minerals are generally always dichroic. Orthorhombic, monoclinic or triclinic minerals are generally pleochroic. Topaz, being a orthorhombic mineral should show strong pleochroism, but the mineral seems to be an exception. In topaz pleochroism is weak or absent. This property can be used to distinguish between blue topaz whether natural or treated and aquamarine. Aquamarine belongs to the hexagonal crystal system and is therefore dichroic. The dichroism in aquamarine is from blue to greenish-blue or bluish-green. The different colors in which topaz can be found are colorless, pale blue, light green, yellow, yellowish-brown, orange, pink and red. Out of these the commonest colors are colorless, yellow and yellow-brown. The rarest colors are pink and red. The colorless variety of topaz is pure topaz without impurities. The colored varieties of topaz contain trace amounts of impurities such as iron. But, these impurities do not impart color directly to topaz. The iron atoms form an unstable species in the crystal, which absorbs a visible photon of light and jumps to an excited state. When these excited species returns to the ground state it emits light in different regions of the visible spectrum, giving rise to the variety of colors given above. The unstable species formed by iron atoms are known as color centers. Natural pink topaz is very rare. There was only one source in the world that produced fine rich pink crystals, and that source was Katalang in Pakistan. But, today most of the pink topaz is obtained by subjecting the brownish-yellow chrome-bearing crystals found at Ouro Petro in Minas Gerais, to careful heat treatment. The heat-induced pink color is permanent, because the pink color center produced by heat treatment is stable. Heat treated pink topaz is also known as Brazilian Ruby. Another form of treatment applied in topaz is radiation treatment. Irradiation of colorless and greenish brown crystals can induce a variety of colors such as smoky-grey, cinnamon-brown, yellow-orange, and blue, depending on the time of exposure to the radiation. The most commonly used radiation process is gamma cobalt 60 radiation. Neutron bombardment using a linear accelerator is less used, and may leave a faint residual-radioactivity, which however dissipates in a few days. Greenish-brown crystals exposed to radiation treatment produces the popular and permanent blue colors not normally found in natural topaz. Such colors are variously known as "London blue," "Swiss Blue" and "Sky blue." Even though it may not be possible to detect radiation treatment, it is well known that intense blue colors in topaz are not found naturally and are produced only by such treatment. All irradiated topaz gems in the United States are processed in a special facility in Missouri to ensure that they conform to strict safety standards. All imported blue topaz are also subjected to this examination before they are released to the importers. The "El-Dorado Topaz" was discovered in the year 1984, in the mineral-rich southeastern state of Minas Gerais, of Brazil. The state had been the premier source of enormous topaz crystals in the world. All the gemstones in the list of 15 famous faceted topaz gemstones greater than 1,000 carats in weight, originated in Brazil, and invariably from the state of Minas Gerais. Please click here for the list. Minas Gerais, the fourth largest state area wise and the second most populous state in Brazil, had been famous throughout history because of its rich mineral resources. Minas Gerais in the Portuguese language means "General Mines" a reference to the gold mines discovered in 1693 and subsequently diamond mines in the 1720s. Most of the production of these mines eventually ended up in Lisbon, the capital city of Portugal, and served in no small measure to boost the riches of the colonial master, helping the country to become one of the most powerful Imperial Powers in Europe. The exploitation of the gold mines were so exhaustive and complete that within about 200 years, in the 19th century, the gold deposits were completely exhausted. During this period Ouro Petro the capital city of Minas Gerais was one of the booming capital cities in the whole of America. By the end of the 19th century even diamond production seriously declined, and South Africa took over as the world's leading producer of diamonds, with the discovery of kimberlite diamond pipes in the year 1871. After Brazil became a republic in the early 20th century, the large deposits of other minerals and gemstones such as topaz, aquamarine, tourmaline, kunzite etc. were exploited by the Government, with the help of foreign participation. Today, Brazil is one of the world's largest producers and exporters of gemstones, 80 % of which come from the state of Minas Gerais. In Minas Gerais, Topaz is produced in the 290 sq. km. region running in the east-west direction, west of Ouro Petro, known as the Topaz belt. Two active mechanized mines in this belt are the Capāo mines and the VermelhÃ£o mines. Capāo, which is situated just outside Ouro Petro, about 5 km from the village of Rodrigo Silva, is an open pit mine. VermelhÃ£o, the second mechanized mine is located about 12 km east of CapÃ£o. Besides this there are also several smaller mines in the region still employing the traditional techniques such as manual digging and panning. It is not known exactly in which mines the El-Dorado topaz was discovered. The Programa Royal Collections is a business grouping launched in the year 1997 in the form of an European Economic Interest Grouping, regulated by the European Union and formed of associated bodies with representations in Europe, the Americas, and Asia. The main objective of the grouping was to build up and maintain a comprehensive and unique collection of gems and minerals that was representative of all varieties and classes, and also precious-metal and gemstone artwork, and then display them to the public or make available for display to the public on a hire basis, in exhibitions, in order to bring natural and cultural heritages to a wider audience. The grouping brought together business institutions specializing in gemology. geology, art, the management of cultural tourism projects, and international trade and communication. The display of a wide variety of rare gemstones and artwork based on precious metals and gemstones, is a culturally enriching experience for the people. The aim of the PRC does not end by providing this experience to the visitors, but continues further in trying to convert these experiences into a discovering and learning process that goes beyond mere passive observation. Within a short period of its inception, the Programa Royal Collections was successful in assembling the world's largest collection of gems, with a total weight of over 500,000 carats, and consisting of thousands of individual faceted gemstones, from all corners of the world, representing all classes and varieties of gemstones, some of which were the largest and most exceptional in their class, that was ever discovered. The El-Dorado Imperial Topaz, is one such exceptional quality topaz, that became famous as both the world's largest faceted gemstone and also the world's largest faceted topaz. The collections of the PRC are assembled under three categories :- Precious Stones, Art, and Natural Sciences. The Precious Stones Collection consisting of thousands of faceted gemstones, totaling over 500,000 carats, is said to be the largest collection of gems in the world. The Art Collection consists of several exquisitely carved masterpieces of sculpture from classical to contemporary, using precious metals and gemstones as the working material, perfected by internationally renowned artists such as Picasso, Dali and Gaudi. It also includes an original precious stones art gallery known as "Art & Gems" representing all five continents. The Natural Sciences section is devoted to mineralogy and other related sciences. It includes a representative collection of minerals, bringing together specimens from all corners of the world. As pointed out earlier the aim of the PRC sponsored exhibitions is not only to provide the common people a rich cultural experience, but also help them to use these experiences to discover and learn more about gemstones and minerals. The twofold experience of enjoying and learning is the main philosophy of holing these exhibitions. In the case of gemstones, every exhibit is accompanied by educational display cases, containing gemological maps, rough gemstones, cutting and polishing equipment etc. A wealth of information in respect of the gem variety is provided in different languages and different levels of specialization, in the form of posters, information panels, photographs, fact files, brochures, catalogues etc. Thus visitors are able to discover for themselves all aspects of the gem industry, starting from the formation of the mineral in the earth's crust, mining, cutting and polishing, the chemical, physical and optical properties of gemstones, testing and authentication of gemstones, differences between original and synthetic gemstones etc. A visitor who had gone through any one of the tailor made exhibition programs of the PRC, might have acquired sufficient knowledge to make confident purchases of gemstone jewelry in the future, without being cheated. The Programa Royal Collections contain the world's largest gem holdings weighing over 500,000 carats. This enormous collection of gems is organized into three categories. 1) Treasures of the Earth - This is the main collection consisting of 15,000 gems, weighing 250,000 carats, classified according to their classes or varieties. 2) Special Exhibition Gems - This constitutes a collection of 20 outstanding gems, brought together mainly for their enormous size and quality. The collection weighs 117,000 carats. The 31,000-carat El-Dorado Imperial Topaz belongs to this collection, which also includes several other enormous and famous gemstones. Imperial and Noble - This collection specializes only on topaz, consisting of 58,000 carats of topaz gemstones of all sizes and colors, such as colorless, blue, yellow, lilac etc. Brilliant Rainbow - This is a diamond collection consisting of over 300 carats of diamonds of various colors such as blue, green, yellow, black and grey etc. Other single theme exhibitions include "Water Flames" which is a collection of opals, "Organic Gems"- a collection of gems of organic origin such as pearls, corals, nacre, ivory, amber etc. "A Universe of Color" - a collection of tourmalines of all varieties, "Fire Born Gems"- a collection of garnets of all varieties, and other similar gems like olivine and spinel, "Princes of the East" - collection of corundum including rubies, blue sapphires and fancy colored sapphires, "Her Highness the Beryl" - a collection of beryls such as emeralds, aquamarines, morganite, and goshenite, and "Everything about the Citrine" - a collection of citrine weighing 50,000 carats. The exhibitions of the Programa Royal Collections are given out on hire under various terms and conditions set by the PRC, to organizations in different countries and cities, that may desire to hold these exhibitions. Such exhibitions are tailor-made to suite the requirement of the hosting organizations, such as available exhibition space, theme requirements, exhibition style, target audience etc. The PRC's experts also provide support and advice during the whole exhibition process, beginning from the designing, transportation, installation, security, promotion and the formulation of educational programs and catalogues. 2. Topaz - A Neosilicate - Edna B, Anthony - The New Mexico Facetor. 3. Gem & Crystal Treasures - Peter Bancroft.